To note is that the information below is an excerpt from the document and it’s not my own writing. birth immediately represents thousands of dollars worth of income across the over 188 injections we’ll receive in a lifetime—according to the complete recommended US vaccination schedule—starting with 128 antigen, adjuvant and excipient injections before reaching adulthood. Vaccines are sold under an extremely clever marketing strategy that encompasses not only a “must-have” scenario for each of us but included with that is absolutely no liability for harm. What do you suppose motivated the vaccine manufacturers to work so exceedingly hard through public and governmental processes to establish a “lawsuit-free zone” for vaccines? Was it to avoid any chance at all of legal challenges? The extraordinary harm you’ll read about here is directly related to seeking that discharge of legal responsibility for damage. 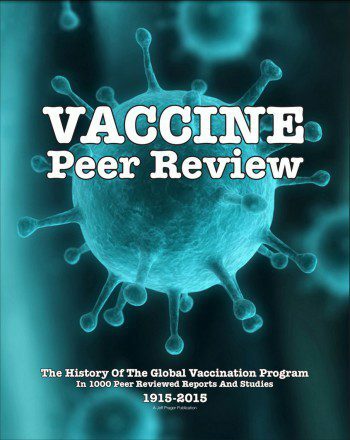 Many of us won’t remember that years ago the lawsuits were mounting and the vaccine business was about to come to an end. This collection of reports reveals the gruesome and stark reality that lies hidden behind what is actually “open-source and public” medical literature that, for reasons unknown, the general public will rarely see. Perhaps the difficulty in finding representative material is an obstacle. Maybe the complexities surrounding the issue are an impediment to fruitful searches. This PDF was created for these reasons. Admittedly, this is a large collection of data that can’t be examined properly in a weekend. Yet the totality of the data is what’s so very important. If one person told us that repeatedly injecting aluminum, mercury, antigens or excipients could be dangerous we might question the theory but when 100s of professionals make a medically supported claim, we should listen closely, don’t you think? plus vaccines currently in use are nothing more than population-wide experiments. Over the past 35 years, patients have suffered from a largely hidden epidemic of side effects from drugs that usually have few offsetting benefts. The pharmaceutical industry has corrupted the practice of medicine through its infuence over what drugs are developed, how they are tested, and how medical knowledge is created. Since 1906, heavy commercial infuence has compromised Congressional legislation to protect the public from unsafe drugs. The authorization of user fees in 1992 has turned drug companies into the FDA’s prime clients, deepening the regulatory and cultural capture of the agency. Industry has demanded shorter average review times and, with less time to thoroughly review evidence, increased hospitalizations and deaths have resulted. Meeting the needs of the drug companies has taken priority over meeting the needs of patients. Unless this corruption of regulatory intent is reversed, the situation will continue to deteriorate. We offer practical suggestions including: separating the funding of clinical trials from their conduct, analysis, and publication: independent FDA leadership; full public funding for all FDA activities; measures to discourage R&D on drugs with few if any new clinical benefts; and the creation of a National Drug Safety Board. Institutional corruption is a normative concept of growing importance that embodies the systemic dependencies and informal practices that distort an institution’s societal mission. An extensive range of studies and lawsuits already documents strategies by which pharmaceutical companies hide, ignore, or misrepresent evidence about new drugs; distort the medical literature; and misrepresent products to prescribing physicians. We focus on the consequences for patients: millions of adverse reactions. After defning institutional corruption, we focus on evidence that it lies behind the epidemic of harms and the paucity of benefts. It is our thesis that institutional corruption has occurred at three levels. First, through large-scale lobbying and political contributions, the pharmaceutical industry has infuenced Congress to pass legislation that has compromised the mission of the Food and Drug Administration (FDA). Second, largely as a result of industry pressure, Congress has underfunded FDA enforcement capacities since 1906, and turning to industry-paid “user fees” since 1992 has biased funding to limit the FDA’s ability to protect the public from serious adverse reactions to drugs that have few offsetting advantages. Finally, industry has commercialized the role of physicians and undermined their position as independent, trusted advisers to patients. If “corruption” is defned as an impairment of integrity or moral principle, then institutional corruption is an institution’s deviation from a baseline of integrity. In the case of Congress, integrity demands that democratically elected representatives should be dedicated solely to the best interests of the people they represent. According to seminal essays on institutional corruption by Dennis Thompson and Larry Lessig, this baseline of integrity is corrupted because elections are not publicly funded. As a result, congressional representatives must constantly raise funds from a tiny percent of the population and respond to their priorities. This dependency corruption creates an “economy of infuence,” even if individual actors are well-intentioned. Lessig’s examples portray how secrecy and rationalizations disguise distortions in the democratic process and mission. The concept of institutional corruption highlights numerous distinctions — between what is legal and illegal; between good people doing bad things, not bad people doing bad things; between infuence, not money, affecting decisions. These are the ends of continua, and there is a need to recognize degrees of corruption in between. Special interests also infuence members of Congress to make legal what has been illegal or else to game the rules, thereby blurring the line between legal and illegal as well as making it hard to determine the law’s intent. Just as a proper electoral democracy is devoted to the public good, health care systems are founded on the moral principles of benefcence, nonmalefcence (“ frst, do no harm”), respect for autonomy, and the just distribution of scarce resources. Based on these principles, health care workers are obliged to use the best medical science to relieve suffering and pain, treat illness, and address risks to health. The institutional corruption of health care consists of deviations from these principles. The major patent-based research pharmaceutical companies also nominally commit themselves to improving health and relieving suffering. For example, Merck promises “to provide innovative, distinctive products that save and improve lives … and to provide investors with a superior rate of return.” Pfzer is dedicated “to applying science and our global resources to improve health and well-being at every stage of life.” Pharmaceutical companies continuously emphasize how deeply society depends on their development of innovative products to improve health. But in fact, these companies are mostly developing drugs that are little better than existing products but have the potential to cause widespread adverse reactions even when appropriately prescribed. This deviation from the principles of health care by institutions allegedly dedicated to health care is institutional corruption. We present evidence that industry has a hidden business model to maximize profts on scores of drugs with clinically minor additional benefts. Physician commitment to better health is compromised as the industry spends billions to create what Lessig calls a “gift economy” of interdependent reciprocation. New research fnds that truly innovative new drugs sell themselves in the absence of such gift-economy marketing. Regulators such as the FDA and the Environmental Protection Agency arise when unregulated competition is perceived to cause serious harm to society and government regulation is needed to address the problem. The FDA was founded to protect the public’s health from the fraudulent cures peddled in the 19th century. Through a series of legislative enactments, often in response to a drug disaster, the pharmaceutical regulatory side of the FDA has acquired ever-wider responsibilities to ensure that new drugs do more good than harm. Institutional corruption consists of distortions of these responsibilities, such as approving drugs that are mostly little better than existing medications, failing to ensure suffcient testing for serious risks, and inadequately guarding the public from harmful side effects. These distortions serve commercial interests well and public health poorly. For the past 50 years, patent-based research companies have objected to the FDA’s gatekeeping function as being too rigid and too slow. They have claimed that an obsessive concern about safety has undermined patient access to drugs that could save lives or reduce the burdens of ill health. This message is increasingly being accepted by the FDA. In response to the emphasis by pharmaceutical companies, their lobbyists, and their trade association — the Pharmaceutical Research Manufacturers of America (PhRMA) — on the high risk and cost of research and development (R&D), Congress has authorized billions in taxpayer contributions to support R&D, exemptions from market competition, and special privileges. Patents, of course, can be found in all industries, but lobbyists for the pharmaceutical industry have successfully pressured Congress to provide several forms of market protection beyond patents. The industry measures “innovation” in terms of new molecular entities (NMEs), but most NMEs provide at best minor clinical advantages over existing ones and may lawfully be approved by the FDA even if they are inferior to previously approved drugs. The preponderance of drugs without signifcant therapeutic gain dates back at least 35 years. From the mid-1970s through the mid-1990s, multiple assessments have found that only 11 to 15.6 percent of NMEs provide an important therapeutic gain. Millions of patients beneft from the one out of six drugs that are therapeutically signifcant advances; but most R&D dollars are devoted to developing molecularly different but therapeutically similar drugs, which tends to involve less risk and cost for manufacturers. These drugs are then sold through competition based on brand name, patent status, and newness, rather than on their therapeutic merits. An analysis of data from the National Science Foundation by Donald Light and Joel Lexchin indicates that patent-based pharmaceutical companies — often deemed by Congress, the press, the public, and themselves to be “innovative” — in fact devote only 1.3 percent of revenues, net of taxpayer subsidies, to discovering new molecules. The 25 percent of revenues spent on promotion is about 19 times more than the amount spent on discovering new molecules. In short, the term “R&D” as used by industry primarily means “development” of variations rather than the path-breaking “research” that onlookers might like to imagine. The independent drug bulletin, La revue Prescrire, analyzes the clinical value of every new drug product or new indication approved in France. From 1981 to 2001, it found that about 12 percent offered therapeutic advantages.But in the following decade, 2002- 2011, as shown in Figure 1, only 8 percent offered some advantages and nearly twice that many — 15.6 percent – were judged to be more harmful than benefcial. A mere 1.6 percent offered substantial advantages. Assessments by the Canadian advisory panel to the Patented Medicine Prices Review Board and by a Dutch general practice drug bulletin have come to similar conclusions. No comparable review has been done in the United States on the 229 NMEs approved by the FDA between 2002 and 2011. This decrease does not come from the “innovation crisis” of fewer new molecules entering trials or eventually being approved but from fewer new drugs being clinically superior. The number of products put into trials has actually increased as the number of clinically superior drugs has decreased. These facts provide evidence that companies are using patents and other protections from market competition primarily to develop drugs with few if any new therapeutic benefts and to charge infated prices protected by their strong IP rights. costs are “unsustainable.” But over the past 15 years, revenues have increased six times faster than has investment in R&D. Almost a decade ago, Jerry Avorn, a widely respected pharmacoepidemiologist and author of a book on the risks of drugs, described how the big pharmaceutical companies exploited patents and concluded that “[l]aws designed to encourage and protect meaningful innovation had been turned into a system that rewarded trivial pseudo-innovation even more proftably than important discoveries.” He also noted that efforts in Congress to introduce a “reasonable pricing clause” that would refect large taxpayer contributions to new drugs were defeated by industry lobbyists. Most new drugs approved and promoted since the 1970s lack additional clinical advantages over existing drugs and — as with all drugs — they have been accompanied by harmful side effects. A systematic review of the 39 methodologically strongest studies performed in the U.S. between 1964 and 1995 examined patients who were hospitalized due to a serious adverse drug reaction (ADR) or who experienced an ADR while in the hospital. The review found that 4.7 percent of hospital admissions were due to serious reactions from prescription drugs that had been appropriately prescribed and used. In addition, 2.1 percent of in-hospital patients who received correctly prescribed medications experienced a serious ADR, for a total of 6.8 percent of hospital patients having serious ADRs. Applying this 6.8 percent hospital ADR rate to the 40 million annual admissions in U.S. acute care hospitals indicates that up to 2.7 million hospitalized Americans each year have experienced a serious adverse reaction. Of all hospitalized patients, 0.32 percent died due to ADRs, which means that an estimated 128,000 hospitalized patients died annually, matching stroke as the 4th leading cause of death. Deaths and serious reactions outside of hospitals would signifcantly increase the totals. Other studies reveal that one in every fve NMEs eventually caused enough serious harm in patients to warrant a severe warning or withdrawal from the market. Of priority drugs that were reviewed in slightly more than half the normal time, at least one in three of them caused serious harm. The public health impacts are even greater when milder adverse reactions are taken into account. Given estimates that about 30 ADRs occur for every one that leads to hospitalization, about 81 million side effects are currently experienced every year by the 170 million Americans who use pharmaceuticals. Groups such as pregnant women, elderly patients, and those who are taking multiple medications are especially at risk. Most of these medically minor adverse reactions are never brought to clinical attention, but even minor reactions can impair productivity or functioning, lead to falls, and cause potentially fatal motor vehicle accidents. Are the adverse side effects we have just been describing simply the “price of progress or an unavoidable risk of drug therapy?” In fact, evidence suggests that commercial distortions of the review process and aggressive marketing contribute to both undermining benefcence as health care’s raison d’être and to the epidemic of harm to patients. Since at least the 1890s, the public has clamored for Congress to regulate contaminated or adulterated foods and harmful or ineffective medicines (medicines that may delay truly useful treatments). At that time, lobbyists — paid from drug profts — argued that even bills to require accurate listing of secret ingredients would destroy the industry. These lobbyists had managed to have earlier bills sent to die in the Committee on Manufactures until President Roosevelt intervened to secure passage of the 1906 Food and Drug Act, which still only required that statements on labels be true and provided no budget for enforcement. Work on what would become the 1938 food and drug law began in 1933 with a bill that would prohibit misstatements in advertising and require manufacturers to prove to the FDA that drugs were safe before being allowed to sell them. The companies’ two trade associations launched “well-choreographed screams of protest” and letter-writing campaigns to mislead Congress and to distort its mission to protect its constituents from harm. Employees of drug makers wrote to Congress, arguing that requiring companies to make honest claims about safe drugs would put thousands out of work. The FDA staff wanted the legislation passed but were stopped by threats of prosecution if they campaigned for it. Then a manufacturer added diethylene glycol (antifreeze) to a sulfa drug to make a sweet-tasting elixir and children started dying. Public response trumped industry lobbyists and Congress passed the 1938 law, requiring that drugs be safe but leaving it to companies to decide how to defne and test for safety. For the next 25 years, drugs were approved within 180 days unless the FDA objected, based on the companies’ tests and reports of safety. Some companies “tested” their products by sending samples out to providers for feedback, keeping no records of the results, and denying serious harms when reported by doctors. Daniel Carpenter, the author of a book considered to be a defnitive work on the politics of the FDA, has detailed how the FDA staff dedicated themselves to enforcing the rules and developing better criteria for safety and effcacy. But as Malcolm Salter, at the Harvard Business School emphasizes, companies institutionalize corruption by getting legislative and administrative rules shaped to serve their interests, either directly or by crafting rules in ways they can game. In his review of new pharmaceutical products in the 1940s and 1950s, Dr. Henry Dowling, an AMA senior offcer and expert, found that companies launched 200-400 a year but only three on average were clinically useful. Physicians, swamped with far more drugs than they could know much about, relied on sales reps to brief them, entertain them, and leave an ample supply of free samples as gifts that the physicians could then give to their patients — a two-stage economy of reciprocation. In effect, through political pressure and lobbying, companies minimized the role of the FDA as the protector of public health for its frst 56 years. Regulatory capture begins with the dependency corruption of Congress, which passes the regulations and provides the funding for agencies to protect the public. While the 1962 amendments ushered in the modern era of testing for safety and effcacy before a drug can be approved, three key features of the modern drug-testing system actually work for industry profts and against the development of safe drugs that improve health. First, three criteria used by the FDA contribute to the large number of new drugs approved with few therapeutic advantages. New drugs are often tested against placebos rather than against established effective treatments, and the use of surrogate or substitute end points, rather than actual effects on patients’ health. Noninferiority trials that merely show that the product is not worse than another drug used to treat the same condition by more than a specifed margin are accepted, rather than requiring superiority trials. Silvio Garattini, founder of the Mario Negri Institute for Pharmacological Research, points out that placebo and noninferiority trials violate international ethical standards and provide no useful information for prescribing. Second, allowing companies to test their own products has led them — as rational economic actors — to design trials in ways that minimize detection and reporting of harms and maximize evidence of benefts. Furthermore, clinical trials for new drugs are designed to test primarily for effcacy and generally are not able to detect less common adverse events. Industry-friendly rules allow companies to exclude those patients most likely to have adverse reactions, while including those most likely to beneft, so that drugs look safer and more effective than they are in practice. Approvals based on scientifcally compromised trials underlie the large number of heavily marketed new drugs with few or no new therapeutic benefts to offset their under-tested risks of harm. Third, companies have created what can be characterized as the trial-journal pipeline because companies treat trials and journals as marketing vehicles. They design trials to produce results that support the marketing profle for a drug and then hire “publication planning” teams of editors, statisticians, and writers to craft journal articles favorable to the sponsor’s drug. Articles that present the conclusions of commercially funded clinical trials are at least 2.5 times more likely to favor the sponsor’s drug than are the conclusions in articles discussing non-commercially funded clinical trials. Yet, journal approval is deemed to certify what constitutes medical knowledge. Published papers legitimate the pharmaceutical products emerging from the R&D pipeline and provide the key marketing materials. For decades, the FDA has kept silent about these practices and about the discrepancies between the data submitted to the FDA by companies and the fndings published in journal articles, to the detriment of patients but much to the beneft of the companies. In sum, testing and FDA criteria approval provide little or no information to clinicians on how to prescribe new drugs, a vacuum flled by company-shaped “evidence” that misleads physicians to prescribe drugs that are less safe and effective than indicated by evidence that the FDA possesses.